I couldn’t be more excited about my social calendar for the summer. I’ll be in two weddings in September and October (and one in January), so it’s pretty much bridal showers and bachelorettes for the next few months. 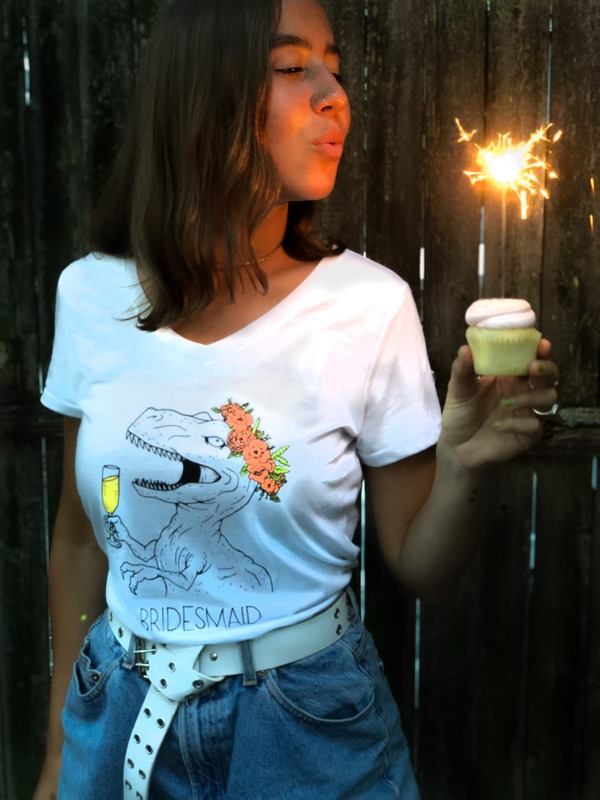 Being a bridesmaid during this time of year is the best, too, because all the pre-I Do parties have a summer vibe that melts away the stress - no matter what. 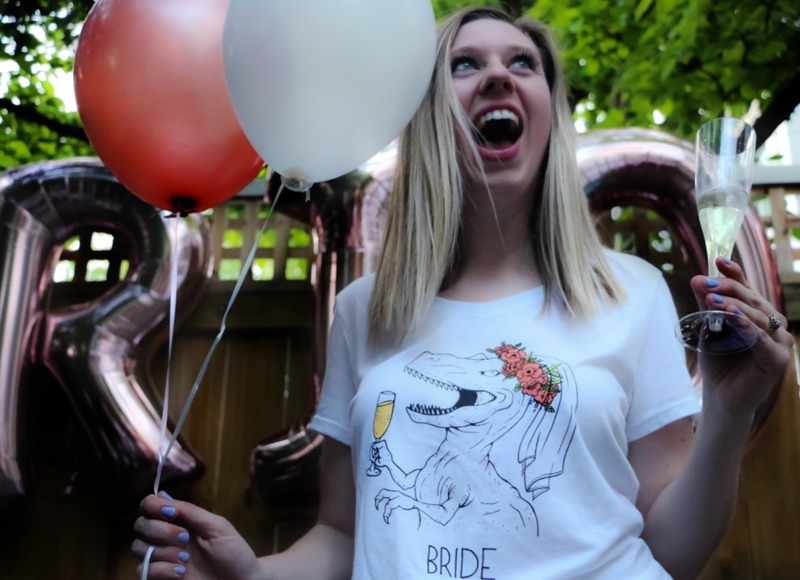 From celebratory champagne sips and bridal badges of honor to cute tees and tanks with custom catchphrases, inside jokes, hashtags or millennial slang that’s #soappropriate to memorialize the occasion, we’re rounding up all the must-haves for summer wedding events. And Custom Ink, the leader in personalized apparel for groups, events, and special occasions sponsored this post to help us out with the custom clothing part of the picture. Because we’re all about those cheeky dress codes for the shower and bach. If you don’t have a souvenir shirt to book end the celebrations, then did they even happen?!?!! 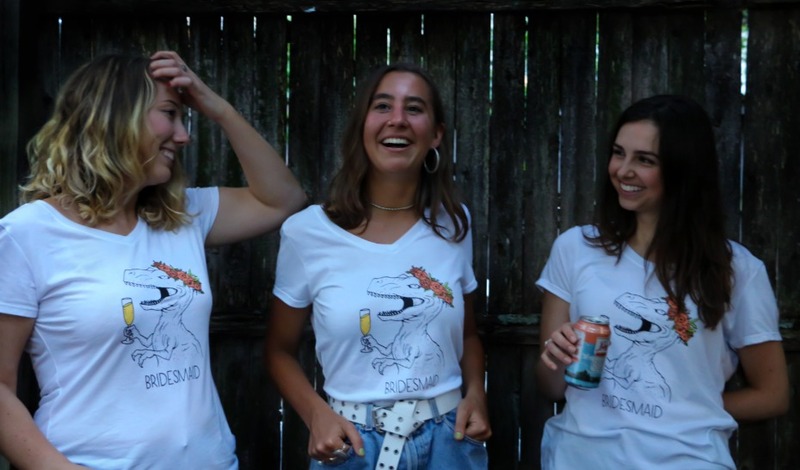 We’ll get granular with all the t-shirt specifics later, but for now, just recall any party from your past that sent you packing with a custom shirt to remember the occasion by. Was it cozy? ✔️ Did it become one of your wardrobe many-wears? ✔️ To this day, does it still make you think of your favorite people on the planet? ✔️ Thought so… You’re never too old for cute custom shirts. I already can’t wait for the bachelorette shirts my sister bought for us for her girls' weekend cruise in July. We’ll all be getting in (uni)formation, and it’s quite fine by me. Comfy and custom FTW. Alright, so let’s just play a game for a minute. An “I Do-I Spy” if you will… to call out all the things your summer soiree needs to be as on-point as possible. Large, small, latex, mylar, in shades to match your wedding color stories or hues that are just haute for summer. 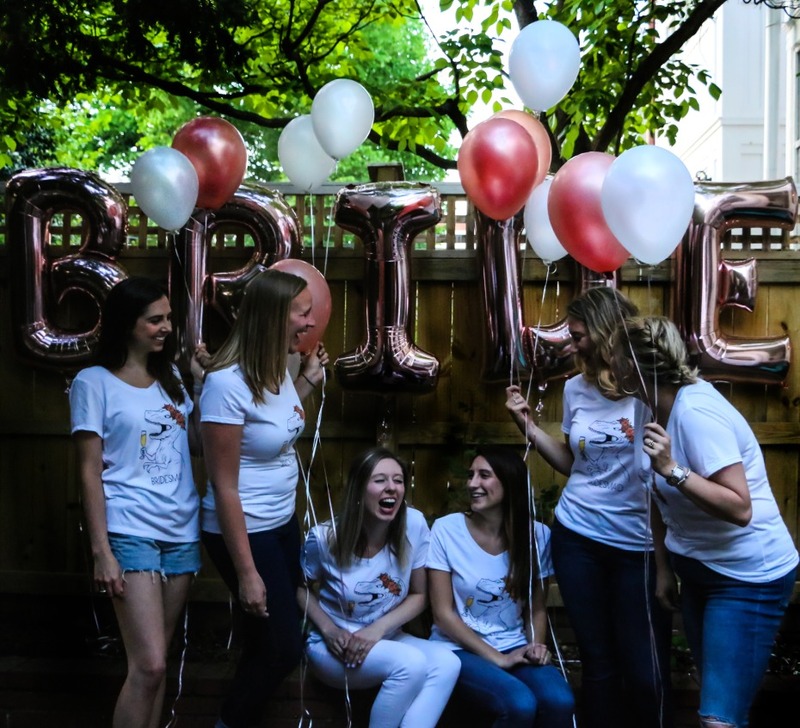 Balloons will always be on our list of nuptials necessities and for occasions like bridal showers or bachelorettes, they’re among the primo priorities. Pretty self-explanatory. If prosecco or champagne aren’t endlessly flowing at your functions, then we might need to take your #basicbride card away. And that’s a sad, sad thing. 😢. We even suggest getting a little more inventive with bash bubbles for sunny-weather shindigs. Whether that means blackberry prosecco mojitos or a French 75, elderflower edition, there’s really no shortage of effervescent elixirs to sip on. You really can’t go wrong with festive fare for your last few flings before the ring. And the summer season is replete with foods completely fete-worthy. From petite pastries to mini munchables - in a full spectrum of sweet to savory - these bites won’t soon be forgotten. 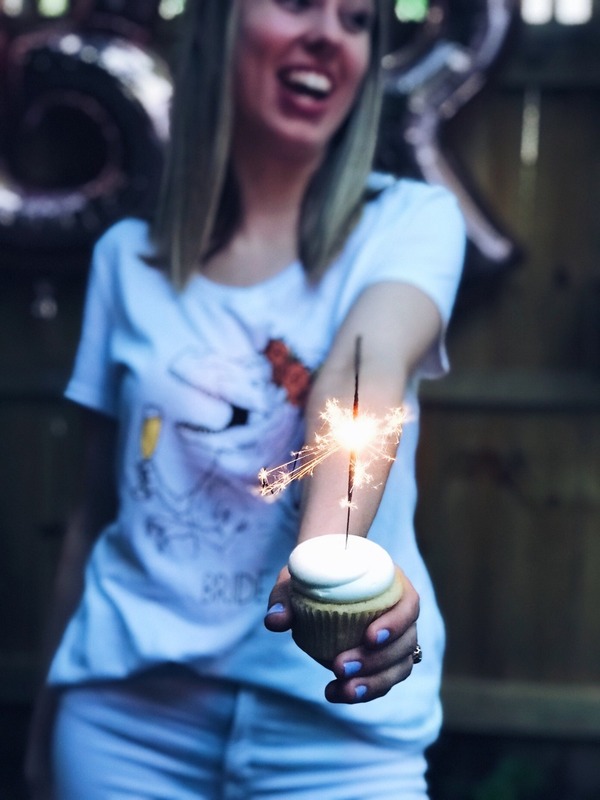 We’d recommend some throwback summer carnival snacking (funnel cakes, cotton candy -- maybe even some booze-infused -- and novelty ice cream bars), but we’ll never say ‘no’ to cupcakes. Ever. On bridal shower and bachelorette days, we wear pink. Whoops, no, we wear #CustomInk. There’s something so special and fun about girls going all out on matching gear, and custom bride tribe gear, at that. The bride’s gotta be able to embrace her #soengaged status, and her girls have to coordinate. For solidarity purposes, of course! Because the hangovers fade but the memories are forever. 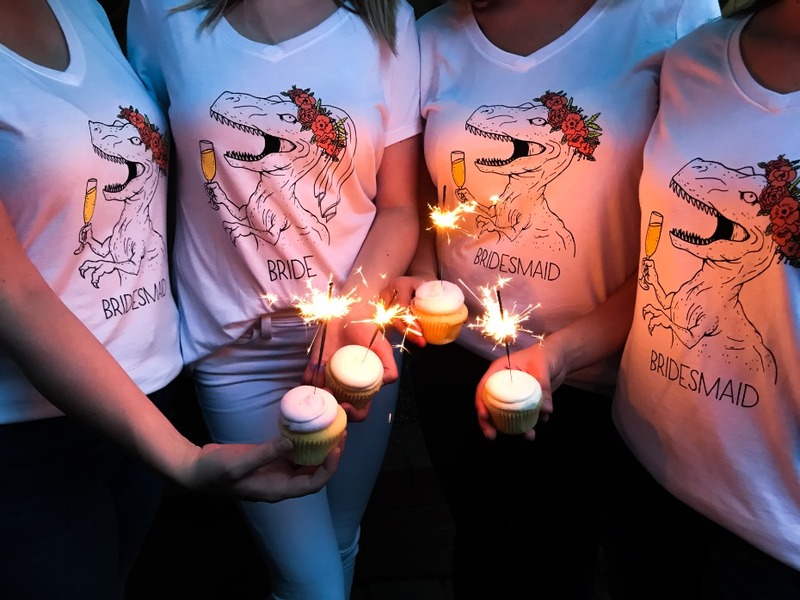 We’re not stereotyping, but if you’ve got a few zilla tendencies, these T-rex brides and bridesmaids tops are tailor-made [not to mention, double-tap worthy for days). And why we love Custom Ink the most? They make the customization process fun and easy with innovative design tools, caring customer service, creative design inspiration, and high-quality merchandise. So, your group gets nothing less than 💯. 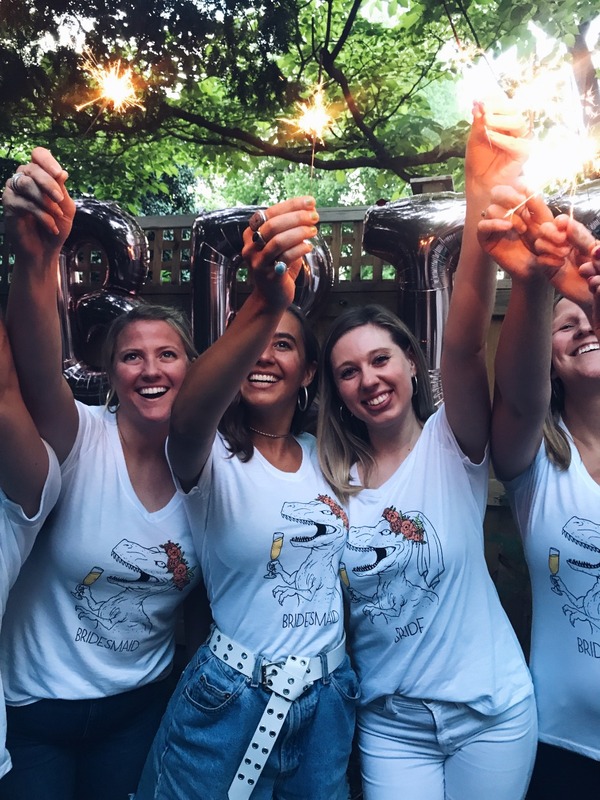 Whether you’re keeping the crew capped around 10 or you roll deep with dozens, the wedding shirts are a sure fire way to bring everyone together on your special day/weekend. Available in short sleeve, long sleeve, sleeveless, tanks, and baseball tees, sizing extends for all ages, shapes and body types, so you can feel confident that all your ladies are feeling good in their gear. 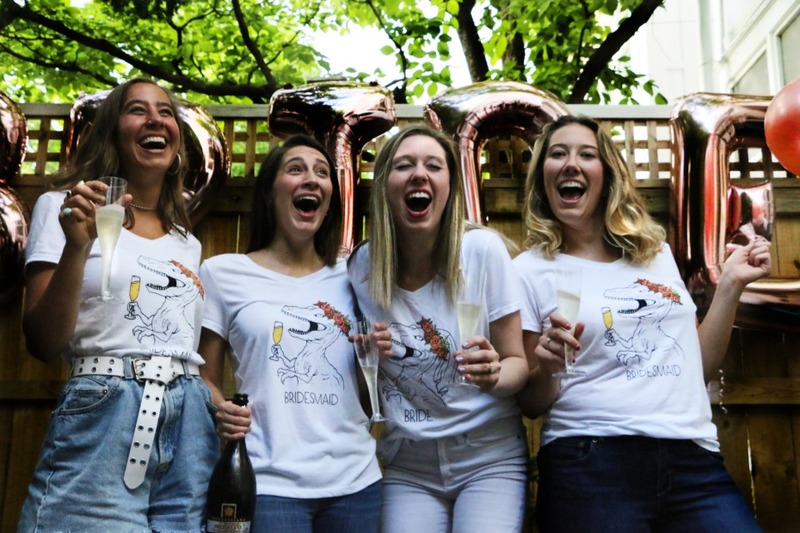 Custom Ink champions a highly collaborative and creative experience, too, so whether you work one-on-one with a product and design expert, "Inker," in-store, or check out the brand's online options, you can be sure your bride or bridesmaids shirts slay. Have a question, but can't make it to a store? One of their customer service consultants can totally chat you through any concerns. And the Design Lab lets you bring your ideas to life. If you’re not exactly a graphic design wizard, no problem. You’ll have free access to a library full of 7,500 editable templates, over 400 fonts and over 70,000 pieces of art to tinker with. And you can start from scratch, too, with an OG design, photo, or logo. Oh, and wedding shirts aren't the only thing Custom Ink shines with. Explore a curated selection of customizable products, including hats, tote bags, drinkware, sunglasses, and more- other things that might come in handy for your celebrations! “The Custom Ink team is super knowledgeable about t-shirts and helped me to choose the right style to outfit my group. When it came time to customize my design they provided recommendations on art and font that was on trend and will make us look great!" 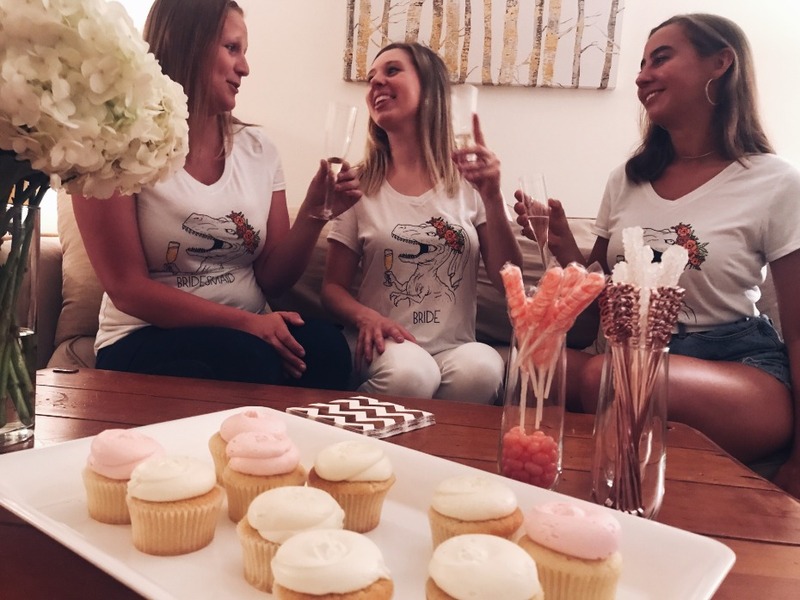 We partnered with Custom Ink to share some of the cutest custom clothes to outfit your crew leading up to your 'I Dos.' As always, thank you for supporting our sponsors!